Wow!! I have finished my recent obligations. I made my post office run yesterday. I have completed and mailed my hats for soldiers, my quilted candle mat for the swap I participated in, and...I sent 5 skeins of of Svale yarn to a fellow knitter who needed the exact dye lot I had in my stash. It's been a busy couple of weeks for me. I have pics but I'll post them later. You never know who might be reading. Now, for me..I am planning to make a lap quilt and a knitted item for each of my children, I have 3. I also would like to do the same of my 3 grandchildren. This decision came about because I am not getting any younger and would love to know that my children/grandchildren will have something made by me regardless of what's to come. When I begin this quest, I hope to document my progress of my process. I'll keep you updated and, see where this leads me. It's been a while since my last post! What can I say, but life and other obligations get in the way. I am currently listening to "Sew-Stitch-Create" and catching up on blogs. Came across I blog, "Handmade by Heidi" and found a post for a Friday Night Sew-In. I thought I would sign up for it. It's November 19th...hoping it will help me focus on at least one project for the night. If interested, go by her blog and read all about it. She is listed in the blogs I follow and her button is in the left column. Heading out to Berryville, VA for "fibery goodness" as Meghan puts it!!! I am sooo looking forward to this. I have not been in fiber overload since May!. I scoured the vendor list and discovered there is one there that also has "Quilt" in it. Can't see what they have. I hope it's a little of everything. I am quite sure I will have more to write and tweet about when I return home. I will take pics of my purchase. Didn't post on Saturday, 9/11. Just an entry to update those who follow. My work week was only three days, however, it felt longer than that I must say. I did get some of my "garage" knitting done. Garage knitting you may ask? I get about 20-30 minutes of knitting in while sitting in my car. I arrive at work, usually an hour before I need to be there. This is my early morning quiet time before my day begins. I am continuing to knit on "my secret" projects. I only have one more to go until I am finished. Spinning: I haven't done any spinning this week. I still have to spin to complete yarn needed for my crochet border on my shawl. Maybe my spinning mojo will return soon. Quilting: Ahh, quilting? Well, I am putting borders on a top in which I used a Moda jelly roll fabrics to piece. The border is solid and pieced. Photo of WIP to come. I am practicing my free motion quilting on small quilt sandwiches. Trying not to pull out the Handi Quilter. It takes time to set the system up. Since I don't have a dedicated room for it to remain up, it's not beneficial to me to set it up. So therefore, I am trying to become comfortable with free motion quilting. My projects are usually not bigger than lap size, especially know. 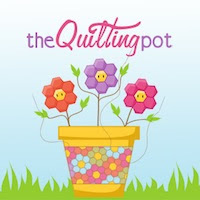 I did catch the latest episode of "The Quilted Cupcake" and hope to join her in her endeavors with her charity efforts. I have to post to her blog about my plans to participate. It's Labor Day weekend, time to chat about my progress or lack there of. Well not too much is going on. Oh yeah, I did buy myself a new laptop, MacBook Pro! I feel a ever so slight potential start of a new podcast. Hmmm, thinking hard about it. Once I get comfortable with my new toy. You see, I have been a "PC" girl the entire time. I also have to admit there is a little learning curve. Back to topic, I have been on leave for the past week and here's what I have accomplished. Knitting/Spinning: My Lazy Daisy Mosswood shawl is 90% complete using my handspun. The pattern, Lazy Daisy Shawlette by OrangeFlowerThe finishing calls for a crochet border. I am in the process of spinning for "said" border. Just a little bit more on bobbin #2, then I can ply. Hopefully I will finish my shawl this week. Also on the needles-"Cornrow Socks" by Preita Salyer, a cuff down pattern. I machine quilted my small basket quilt. My attempt at "free motion" quilting needs a lotta of practice, however, for me-it's not too bad. I will say, I wouldn't give it to anyone as a gift. I'll keep practicing my free motion quilting! Practice = improvement. On my design wall are blocks, that I have arranged for the "Spiral Stripes" quilt from the book, Jelly Roll Quilts. I'll take a second look, after a good nights sleep, to be sure that I like the arrangement of the blocks. So until next week, for me, it's Just Fiber and Quilts. Hi to those few who read my blog and thanks as well. My intent was to blog about my knitting and spinning journey as I go along. Also, I was suppose to blog every Saturday. Well, this is a Saturday and I am blogging, however, it's been about a month since my last!!! I will only say, I will blog when possible. Committing to a specific day seems to be bad "mojo" for me. So, when I blog I blog. It's a place for me to chat "out loud" about me. So there! BTW, I am 98% sure I am going to purchase a "Fancy-Kitty" drum carder from Ron. If you have not seen it, there is a Rav group. 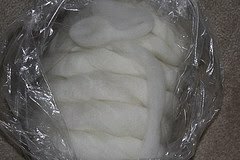 Oh, also, I sent my 6.5lb correidale to Morrow Fleece Works for processing. (as recommended by Jasmine of the "Knitmore Girls") I did keep a little to process my self. Have a "happy dance" Saturday!